"FreeChocolate!" is in public beta! “But I do. With 'FreeChocolate!' I’m trying to bridge that gap, by initiating the development of software with a radically simple user interface in front of a very sophisticated, natural-sounding control system. 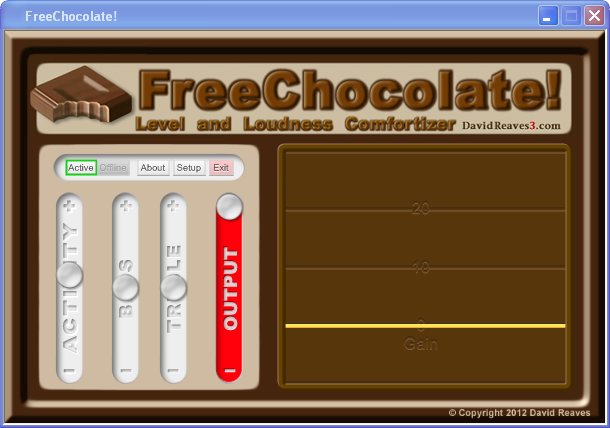 If I do this right, such a control concept will allow the end-user the option to maintain loudness levels within their own personal ‘comfort zone,’ while, importantly, perceptually maintaining the integrity of the original work." "CALM (US Congress' loudness legislation) may be a great solution for broadcast TV, but what about DVDs, downloaded or streaming media, watching a movie on the plane on your iPad, or the 'train wreck' transition from old to new songs on your iPod? I'm leveraging my professional audio processor design studies and experience to focus directly on the commonality of those problem areas, to put effective loudness control where it's presently most lacking: at the fingertips of the consumer." "In short, my goal is to enhance the media user's experience by giving them a simple control to dial-in whatever dynamic range feels exactly right to them, whenever they like, wherever they are, whatever they're listening to or watching, on whichever device they are using." 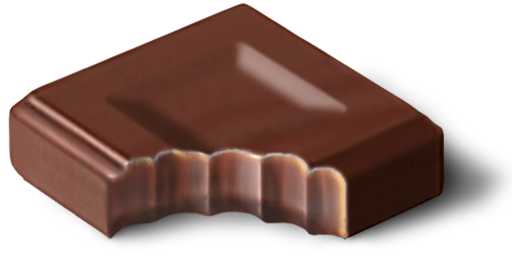 Reaves is initially offering a free Windows app “FreeChocolate!” to get as much initial user feedback as possible before moving forward, and to work out any rough edges in the idea. System requirements are Windows XP SP 3, Vista or Windows 7. Works with ASIO or standard Windows audio I/O drivers. David P. Reaves III is an independent DSP audio design engineer. He formed DavidReaves3.com in early 2012 upon leaving TransLanTech Sound, LLC which he co-founded in 1998. His broadcast engineering experience includes 8 years as Chief Engineer of WHTZ/New York (Z100) from 1988 to 1996 and three years at NBC Television, New York, 1997-2000. At TransLanTech Sound, LLC, he conceived and designed the (analog) Ariane Stereo Audio Leveler, and led the design of the Ariane Sequel Digital Audio Leveler, AGCs that are in successful service at hundreds of broadcast facilities the world over. Reaves has made several formal presentations on the subject of sound processing and loudness control at preeminent engineering conferences, including national and international meetings of the Audio Engineering Society (AES) and the National Association of Broadcasters (NAB). Born in Gainesville, Florida, David Reaves currently resides in Recklinghausen, Germany, with his wife, professional violinist Ariane Reaves. Recklinghausen, Germany, Feb. 1, 2012 -- David P. Reaves, III, half-interest partner in Translantech Sound, LLC since its founding in 1998, has formally ended his relationship with the company, effective December 31, 2011. "In autumn of 2009, I took an indefinite leave while the separation details were worked out," said Reaves. "I have spent the past two years advancing my basic knowledge in the fields of mathematics, audio DSP and software coding (C, C++ and Objective-C with Cocoa/CocoaTouch) and Loudness Perception theory. This is added to what I would like to believe is substantial analog design experience and an intuitive grasp of what qualitatively works and doesn't in high-performance loudness and level control." "So the beginning of the New Year 2012 is more than symbolic to me: I'm looking forward to joining or even founding a group of like-minded, passionate, hungry design collaborators and a support team, to create effective, user-focussed products. Beyond traditional broadcast hardware, I see incredible untapped opportunities for high-quality automatic audio control in personal, mobile and cloud applications. My overall goal has been and continues to be to make audio listening more enjoyable for my ultimate customer, the media consumer." David Reaves built his first crystal radio kit when he was 8, was learning to solder by 12 and passed his FCC First Class Radiotelephone License exam at 16. Reaves' experimentation with automatic level control ideas began during his high school years. He began his professional career in small-market Gainesville, Florida, where he was born, and worked his way up from there. "I am especially grateful to have had the opportunity to work for some truly phenomenal broadcasting institutions, including eight years as the Chief Engineer of New York's legendary Z100 (1988-96), and three years (1996-2000) for NBC-TV in the historic studios at 30 Rock." Reaves has also made a number of formal presentations expressing his processing ideas to both AES and NAB national conferences. Looking back, David, with his wife Ariane, whose name he attached to the Translantech products he conceived, have only positive wishes for TLT: "Ariane and I wish Julie and Jim at TLT the best of luck in their future endeavors, whatever they may be, with success to the fullest extent of their talents and diligence." While the Ariane product and brand name will remain behind with TLT, Ariane Reaves has other plans: "I'm sticking with David," she laughed.